Operation Christmas Child conference participants learn the impact that each gift-filled shoe box can have on children around the world. When Alex Nsengimana was a small child, he, his brother and sister lived with their grandmother and extended family. A group of militia came to his home, took his grandmother, a Tutsi, and killed her. A few days later, 100 men came to their house looking for his uncle, the family’s main provider. Over the next few months, more of his relatives were killed by Hutus in Rwanda. Yet, he and his siblings survived on the run, dodging bullets and hunting parties, sleeping under their beds to avoid being hit by shrapnel. Once, all that saved Alex from being shot was that he slipped on a fresh cow pie and fell to the ground as a bullet whizzed by. Alex didn’t know it at the time, he said, but God was protecting him. Eventually, having lost all hope, he ended up in an orphanage, where he received an Operation Christmas Child shoebox at age 7. Inside, he found a foldable hair comb that he kept for three years, and something he had never seen before-a candy cane. He said the seeds of love and hope were planted in him. A year later, he was selected to be part of the African Children’s Choir and tour the United States, but first he had to go to Uganda for training and to learn English. During that time, he came to know that God loved him and had rescued him because he had a purpose for the lives of all genocide survivors. But as he grew up and grew in his faith, still he could not forgive the men who killed his family. Just a few weeks ago, Alex returned to Rwanda to hand out OCC shoeboxes at the same orphanage. And through the grace and strength of God, he met one of the men who had killed his family and extended forgiveness and hope to him. As Alex shared this story with 2,000 volunteers at the OCC Global Connect conference in Orlando, Fla., this past weekend, tears ran down his face. In fact, there were very few dry eyes in the crowd. We heard similar stories from others: Lejla Allison, who at nine years old wanted to die because life was so hard in wartorn Bosnia, received a pair of shoes in her shoebox to replace the ones falling off her feet-and knew that God loved her; Ted Foreman, who shared a towel with 19 other orphans in a Russian orphanage, received a wash cloth/towel of his own and paper so that he could write to his sisters in another orphanage. Those are just three of the 100 million-that’s 100,000,000-shoeboxes that have been given to hurting children around the world in the past 20 years through OCC. 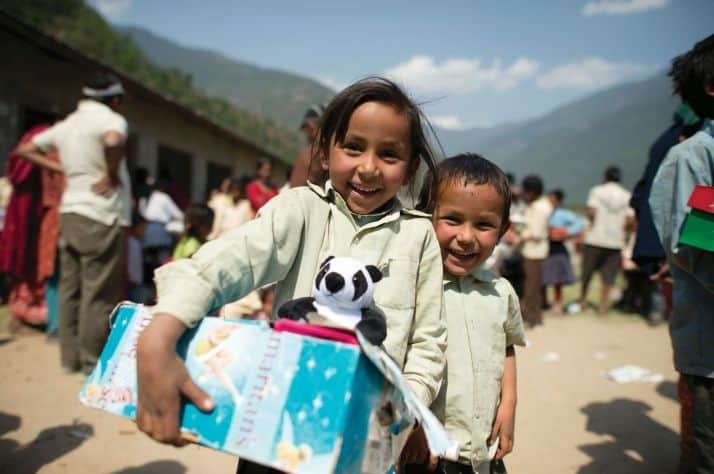 The shoeboxes aren’t just shoeboxes, says Franklin Graham, son of evangelist Billy Graham. Each one represents an opportunity to share the gospel. The younger Graham heads up Samaritan’s Purse, the Christian world relief organization that co-ordinates OCC in 10 sending countries and 100 receiving countries. The OCC conference was a celebration of those first 100 million boxes, plus a challenge to see how quickly we can get to the next 100 million. Anyone who thinks of Operation Christmas Child as “that shoebox thing” we do every November doesn’t grasp the big picture and the global impact that OCC has. What other project can someone from south central Manitoba be a part of that last year alone helped nine million children feel someone loves them? Plus, that box allows Samaritan’s Purse to further meet both their physical and spiritual needs. Personally, I feel honoured to have been a part of a project of this magnitude for the past 10 years and my passion for OCC has grown thanks to this conference. If you want to know how many children chose to participate in OCC’s follow-up discipleship program after receiving a shoebox and how many accepted Christ, ask me. It will get you fired up, too! Clarise Klassen is managing editor of the Herald Leader and logistics co-ordinator for the Portage la Prairie-area collection centre for Operation Christmas Child.